It’s time to save the world from aliens, but how? We could solve a lot of puzzles, blast enemies away with big guns, fly through space in an intergalactic warship or, alternatively, play football. In the universe of Inazuma Eleven 2 there isn’t a single problem that can’t be solved with a football – or soccer – match. It’s video game nonsense at its finest, with enough charm to make even the biggest cynic smile. 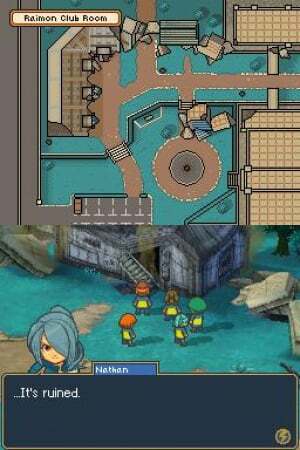 It’s also a meaty RPG experience, making it a continuation of the series debut and yet another intriguing title to grace the DS library in Europe, even this late in its lifespan. Following the example set by Pokémon, this title actually comes in two versions, Firestorm and Blizzard: we've reviewed the former, though differences between the two versions are minor. 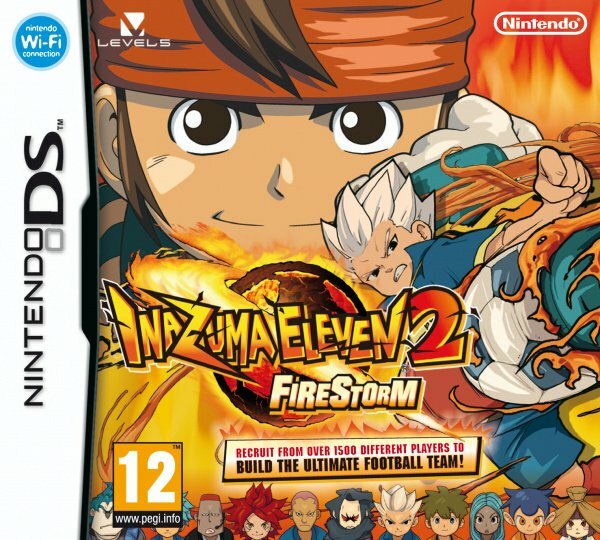 This sequel follows on directly from the original Inazuma Eleven, set in Japan, with captain Mark Evans and the victorious Raimon Junior High School team fresh from winning the Football Frontier tournament. 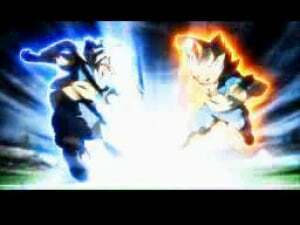 Just as they return to training an alien group called Alius Academy arrive and start destroying Japanese schools, with the stated goal of crushing humanity by beating it at its most popular sport, football. Schools are given the opportunity to save themselves by beating the aliens in a match, but inevitably lose to their power and skill. 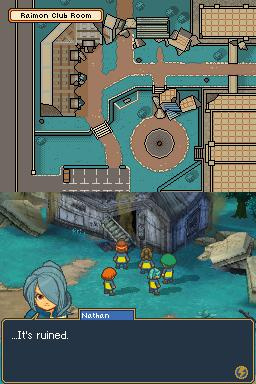 The Raimon Eleven, who dream of matching the abilities of the fabled Inazuma Eleven of past times, take it upon themselves to defeat the aliens and save the nation in the process. The storyline, and the alien opposition, evolves with plenty of twists and turns, including the old RPG trick of building up to a ‘final battle’, before a previously unseen and particularly deadly enemy emerges onto the scene. 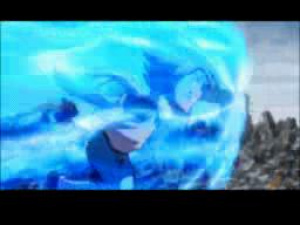 In the context of the Inazuma Eleven world the storyline works well, with enough light-hearted moments to offset the many moments of danger and tension. There are occasional animated sequences, appearing about as frequently as in the Professor Layton titles, for example, with a lot of storyline also shared via in-game dialogue. Being an RPG developed primarily for the Japanese market, the storytelling can certainly be described as wordy: it’s not overbearing, but talking sections appear frequently. As you may have detected from our description so far, those unfamiliar to the series should know that this is a football title in the loosest of terms. Plenty of time is spent travelling to different locations, exploring towns, buying items to manage health and TP — which is vital for executing special moves – and expanding your roster of players. All of these actions have enough depth to consume a lot of your time: you can add players by scouting, recruiting from teams you’ve defeated or through a separate ‘Connections’ mechanic. Managing your team formations, each individual’s equipment or even which abilities are applied to which player can either be dabbled with occasionally or indulged in with great detail, with hours and hours of grinding and customisation possible. Gamers who just want to play the story and engage in football battles can, however, progress with minimal customisation. The actual football part of the experience takes place in short-form and random ‘battles’, or in story-driven 11-a-side matches. While normal exploration is controlled with the D-pad, matches are played exclusively with the stylus, with an intuitive system that has you tapping where you want to kick the ball or drawing paths for players to run. The pace is deliberately slow — the control scheme simply wouldn’t be appropriate otherwise — but its steady pace does allow for tactical play, giving plentiful opportunities to use the many special moves on offer. Whenever you shoot or clash with an opponent you have a choice of actions, both basic and special, to choose from. Special moves are specific to goalkeepers, defenders or attacking players and drain the player’s energy: they are, however, vital to your chances of success. All moves that aren’t simple running or passing prompt short animated sequences, and the special moves are wonderfully bombastic and over the top: everything from dragons flying balls into nets to goalkeepers using enormous God-like hands to stop shots. The short-form battle matches only involve four players on each side, with an objective of winning possession or scoring the first goal to win and accumulate Prestige points (currency) and Friendship points (needed to recruit players). These battles last less than a minute with a loss, or if you decide to run away, losing you points. In keeping with traditions of old-fashioned RPG mechanics, these battles often occur randomly when moving around in locations. Although useful for leveling up players' capabilities – it’s worth rotating the line-up to boost different squad members – these battles can be an irritation. Sometimes they seem to be well separated, while on other occasions they occur rapidly and slow down progress. It may be a well-used mechanic in the genre, but that doesn’t mean it can't be flawed. The less frequent 11-a-side matches are longer affairs, and are often full of tension due to the level of opposition and the requirement — for the sake of story progression — to secure a victory. These are balanced particularly well, with the sense on almost every occasion that the opponents are almost a perfect match for your team’s abilities. Being careful to not over-use special powers, making tactical changes and countering the enemy’s own impressive range of techniques is engrossing and entertaining. Some match events are pre-ordained, most discouragingly guaranteeing that some early matches are lost regardless of your actions, but generally require your skill and experience to progress. Outside of the substantial single player campaign, some multiplayer components have been included. We were unable to test the local multiplayer options – which include competitive matches, team sharing and player trades – as they require another player to own the game. They look promising if you do have friends with a copy, and along with item updates from Nintendo via a download option there is potential for an impressive extra level of immersion. It’s important to also note that the cart does only support one save file for both single and multiplayer modes, which is a pity for families that plan to share a copy. As would be expected of a DS title, the overall presentation of these various facets of the title is fairly limited. 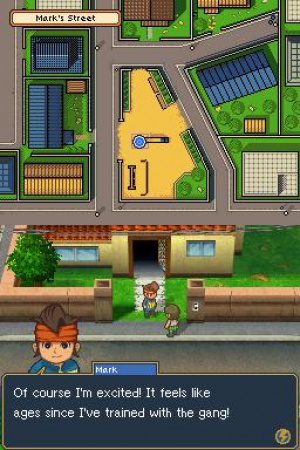 The overworld and pixel-based characters are colourful and fairly charming, though don’t represent the best graphics that DS has to offer: perhaps understandable due to the size of the game. While animated clips feature good voice work and music, the occasional in-game voices sound distorted, while the music is largely forgettable. Though the sound is average, plenty of effort has gone into the art design; enough to make the rough edges forgivable. Inazuma Eleven 2 successfully takes its core RPG mechanics and dresses them in an entertaining, quirky football strip. While it may appear to be fairly frivolous at first glance, at its heart it is a substantial experience, well balanced to be either dauntingly complex or an RPG-lite, depending on the player’s wishes. The slow-paced football action works well when combined with extravagant special moves, while touring around Japan and meeting a range of quirky characters is a pleasure. There are flaws, such as an over-zealous bombardment of unwelcome random battles and some shortcomings in presentation, but overall it’s another DS RPG that’s worth a shot. Umm may get this,but i might just wait for the 3DS version! Hopefully they'll be a bit quicker with the 3DS games, but considering the sheer volume of text and menus, the localisation must take quite a lot of effort. I couldn't get on with the first game - the controls were just too fiddly. You had to be ever so precise with your runs and passes, and in my case, more often than not, the opposing team would end up with the ball. Sometimes, I'd struggle to keep up with the players, despite its slow tempo - scribbling at the screen to try and get my players to change course or go where I want them to go. And don't talk to me about the scenario matches where the rival team could do anything from immobilizing you at a whim to having unlimited TP. The lad and I have been playing this since launch. Great game. You get used to the controls. If it wasn't for KI: Uprising, I would have finished the Firestorm game by now and onto the Blizzard version. I hope the game does well so we can get the final DS instalment (even if it will take awhile). Huh what who? Very random idea for a game indeed. Making my way through the first game at the moment. Enjoying it so far, and will probably move onto this next. I swear the first one has barely been out for a year! I thought football was only the second most popular sport? Isn't number 1 like volleyball or something? I really need to start importing these games. Good sports/RPG hybrids always seem to hit the spot with me. They seem to be catching up, so the optimist in me hopes for the third DS entry, and maybe even the first 3DS spin-off, in the next 12-18 months. @TeeJay I believe it's based off a TV show. @ThomasBW84 Thank you good sir! That clears things up for me. I just got the first one yesterday, it was bargain for only 10 euros, so I could finally work-up my courage and try something incredibly stupid like this. The game is actually surprisinly decent so far aside from the touch screen controls which I will always hate in any shape and form.